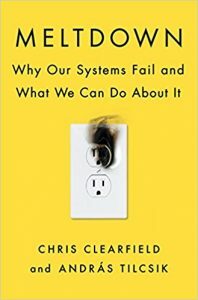 The current book I am reading is called Meltdown: Why Our Systems Fail and What We Can Do About It, by Chris Clearfield and András Tilcsik. This is an excellent book on organizations, and I am enjoying reading it very much. It takes some actual events, both big and small, and unwinds them to discuss the difference between “loosely connected systems” and “tightly connected systems” and how that difference can mean disaster if we are not careful. One extreme example they analyze is the Three Mile Island nuclear plant meltdown, where a series of mechanical and human errors caused the worst commercial nuclear accident in U.S. history. In one experiment, for example, immigration officers accepted ID photos that didn’t match the person they were looking at one in seven times. These experienced officers were just as bad as students who participated in the same experiment. Cops, too, aren’t better at detecting lies than untrained students. And people in wicked environments often make decisions based on irrelevant factors. One study showed that during a busy day of hearing parole cases, judges—who rarely get independent feedback on their decisions—are much more likely to grant parole right after meal breaks. The difference was huge: the percentage of favorable rulings was around 65 percent right after a meal—but gradually dropped to nearly zero before the next break! Fascinating! I am not finished yet but loving this book.